I tried the Maple Brown Sugar variety of this cereal. I think my wife summed it up best when she said, "I like it. It reminds me of a healthy version of Super Sugar Crisp." 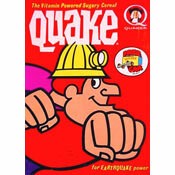 Imagine if Kashi made Super Sugar Crisp and you get an initial picture of this cereal. The first thing that grabs you is the intense smell of maple when you open the package. It doesn't taste as intense as it smells, but there is noticeable maple and brown sugar in each bite. Some people might find this cereal too sweet. It has 16 grams of sugar which is quite high for a cereal that most would consider a healthy option upon seeing the box. That sweetness is an element that I actually liked a lot. This cereal felt like I got 3 cereal experiences in one. The initial sweetness and flavor reminded me of a kids cereal from the 80's. The combination of oats and puffed wheat reminded me of many of today's healthier cereals. As you eat the cereal, it breaks down into a traditional granola texture and flavor. The last couple of bites from a bowl are the best. A lot of the flavor gets transferred to the milk and those last spoonfuls have almost double the flavor. One significant problem... the cereal says it's made with real pecans and there's a big beautiful piece of pecan in the spoonful on the front of the box. Try as I might, I could not find pieces of pecan in my box. Even with the missing pecans, I think this cereal is worth a try. It's not as healthy as it wants you to believe but it's probably more tasty than the box indicates. 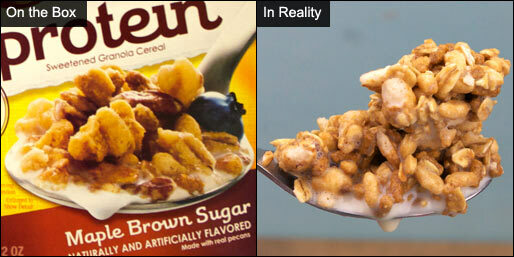 Another variety of Fiber One Protein called Cranberry Almond came out at the same time as this cereal. As of this writing, I haven't tried that version. If you have, please leave a comment below. Nutritional Considerations: Each 1 cup serving of Maple Brown Sugar Fiber One Protein has 220 calories, 6 grams total fat (0.5 saturated and 0 trans), 0mg cholesterol, 150mg sodium, 40 grams total carbs, 5 grams dietary fiber, 16 grams sugar and 6 grams protein. 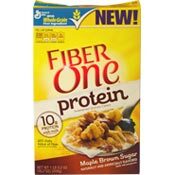 What do you think of Fiber One Protein? Apparently the Fiber One Protein Cereals were discontinued. I wish they would bring them back! My Price Chopper doesn't sell it anymore! I love this stuff and use it sparingly on top of raisin bran. Try that. It is SO good. Then you never have to add any type of sweetness. It smells like French toast.